Breastfeeding your baby provides him or her with a proper and complete nutrition. This is because the milk provides the required nutrition, along with vitamins, minerals and immunity to the baby. According to experts, it is highly advisable to breastfeed your baby for the first few months. However, some mothers are concerned about when to start fresh milk for babies. Throughout this article, you will get helpful information on when is the right time to introduce your baby to cow milk for infants. To start your baby on cowmilk as the main diet, you should wait until he or she is a year old. Administering cow milk as the main diet for the baby before he or she is a year old will deprive the baby of the essential nutrients for normal growth. However, you may use other milk products, such as mild cheese and yoghurt as part of your baby’s meals, once she is six months old. After the baby has started having solids, you can then introduce cow milk into his/her diet gradually. 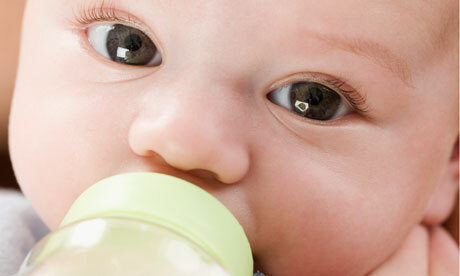 Between six months and one year of age, the main food for the baby should still be breast milk. However, you may also give the baby foods that are rich in iron. Since cow milk does not contain a substantial amount of iron, you can give the baby full-fat cow milk, along with iron-rich foods, after he/she is a year old. The milk should be administered in a lidded cup or a beaker that has a soft sprout. If you are comfortable breastfeeding the baby, you may continue doing so after she is a year old. Cow milk is beneficial to the baby in that it provides energy, vitamins A, B12, B2 and D, calcium, magnesium and protein. After your baby is a year old, you can start giving him or her at least 350ml of full-fat cow milk in a day. It is advisable to give the baby full-fat milk rather than skimmed milk because skimmed milk does not contain as much nutrients as the full fat cow milk for infants. According to the American Academy of Pediatrics Committee on Nutrition, it is not advisable to give your baby cow milk until she or he is a year old. This is mainly because the milk can lead to iron- deficiency anemia and/or allergic reactions in babies of this age. In some cases, the rate of development of the intestinal lining is a bit slow in some babies. Although it is highly unlikely for infants to develop lactose intolerance, giving the baby cow milk before the recommended age, one year old, can lead to an array of complications, such as bloating, abdominal pain and diarrhea. This is because of the slowly developing intestinal walls, which render them unable to digest lactose in the milk. Additionally, some proteins may pass through the irritated intestinal walls into the bloodstream. This can result into allergic reactions, such as wheezing, runny nose or raised and red rashes that appear like sandpaper, on the cheeks of the baby. Since the cow milk does not contain enough iron, giving the milk as the main food for the baby before he or she is a year old may result in iron-deficiency anemia. When to start fresh milk for babies should not be the only concern for nursing mothers, but also how to go about it. After the baby is a year old, you should introduce cow milk for newborn baby strategically. So, how exactly do you go about it? At the beginning, you should give the baby cow milk in a cup. In most cases, babies love the taste of cow milk and you should not have any problem getting the kid to take the milk. However, you should avoid giving the baby cow milk every now and then; it should only be given during snack and meal time. Between the age of one and three years, you should give the baby 16 ounces of cow milk in a day. Within this age, you may as well breast feed the baby from time to time. After the age of three years, the milk should be administered as a complement to solid foods. Some kids may develop allergic reactions to cow milk, which is characterized by such symptoms as hives, lip swelling, blood in stools or vomiting, a short period after the baby has taken the cow milk. If your baby is on a hypoallergenic or soy formula, you should consult a pediatrician before introducing the baby to cow milk. In most cases, the baby should stop having such reactions when she reaches two years of age. Intolerance is different from allergic reactions and will manifest in the form of bloating, loose stools and gas. This happens when the intestinal system of the baby is unable to digest lactose in the cow milk. In such cases, you should supplement the milk with foods that are rich in vitamin D and calcium. Some kids may have a difficult time adjusting to the taste of cow milk. If your baby does not like the taste of cow milk, you can either combine it with a formula or breast milk to get the baby to take it. You may then increase the cow milk content in the solution gradually. Initially, the baby was thriving on breast milk alone. As such, you should just continue giving her breast milk, if the cow milk is not working. Since the baby is very active after they reach one year of age, you should find time to nurse him. Two times in a day will be okay. Again, you should also ensure that the baby suckles before going to sleep. Normally, the baby will increase the frequency as well as the duration of breastfeeding to meet her body requirements. If this does not happen with your baby, you may need to introduce iron-fortified DHA/AA-enriched formula into her diet. If the baby is responding well to cow milk, you may as well give her between one and two 8-ounce bottles of full-fat cow milk every day. This intake should be broken down into frequent feeding sessions in a day. As compared to cow milk, yogurt is more nutritious because it contains more calcium per ounce, the fermentation of yogurt breaks down lactose and proteins for easier digestion and it contains beneficial bacteria. While purchasing cow milk for your baby, it is advisable to get the organic one. Milk from some dairy cows may contain hormones, antibiotics as well as other harmful substances for the baby. Can You Reheat Breast Milk? Does Beer Increase Milk Supply? How Long Does Breast Milk Last in the Fridge? At What Age Is It Safe for a Baby to Fly?